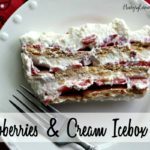 This is a beautifully sweet and fruity icebox cake, full of fresh strawberries and rich cream. And best of all, it's a no-bake dessert! Have ready an 8-cup loaf pan (mine is 5.25" x 9" x 2.75".) Place a mixing bowl and beater into the freezer, to chill them for whipping cream. Set aside 3 whole strawberries for use later. Hull the berries, and then slice them vertically into thin slices. Set them aside. Assemble the bowl and beater. Turn the mixer on low and slowly pour in the whipping cream. Add in the vanilla and increase the speed to medium-low or medium. The cream will whip faster the higher you can have your speed: find the highest speed you can go to without cream flying all over the kitchen! Once the whipped cream is finished, fold in the plain Greek yogurt. Take 1 cup of the whipped cream mixture and spread it over the bottom and most of the way up the sides of the loaf pan. Break the graham crackers along the perforated lines and make a single layer of grahams over the bottom of the pan, on top of the cream. Fit the pieces in as closely as you can. Lay a layer of slices strawberries over the top of the graham crackers, fitting them close together. Take 2/3-cup of the cream mixture and spread it evenly over the strawberries. Add another layer of grahams and a layer of strawberries as you did in steps 7 and 8. Repeat the layers one more time with 2/3-cup of cream first, then grahams and then strawberries. Spread the remaining whipped cream mixture over the top of the cake. Wrap the pan in plastic wrap and place it in the coldest corner of your refrigerator. Chill for 8-10 hours: overnight is ideal. Remove the cake from the fridge. Cut the cake into slices as you would a loaf of bread and serve immediately. Leftovers can be refrigerated for up to 4 days. Makes 8 servings. *Plan this cake in advance, it requires an overnight stay in the fridge before serving!